There’s been a move towards smaller engines in the car market as a whole. But in the world of pick-up trucks, where once every model had a 2.5-litre turbo-diesel, things have diverged. Up top, the Ford Ranger offers a 3.2-litre option and the old 2.0 TDI in the VW Amarok has just been replaced with a 3.0-litre unit. But now here’s the Isuzu D-Max, fi ve years on from its arrival in the UK, heavily downsized from its old 2.5-litre engine to a new lump displacing just 1898cc. Can such a small engine work in a mainstream one-tonner? That’s the question Isuzu needs to answer if the D-Max is to maintain the huge success it’s achieved since 2012. There’s more to the new D-Max than just a smaller engine, however. Its styling has been freshened up, its cabin has been improved and all models now feature hill start assist and hill descent control. Audio systems are new across the range, too, and the front bumper and bonnet have been redesigned to give pedestrians a better chance should the unthinkable happen. 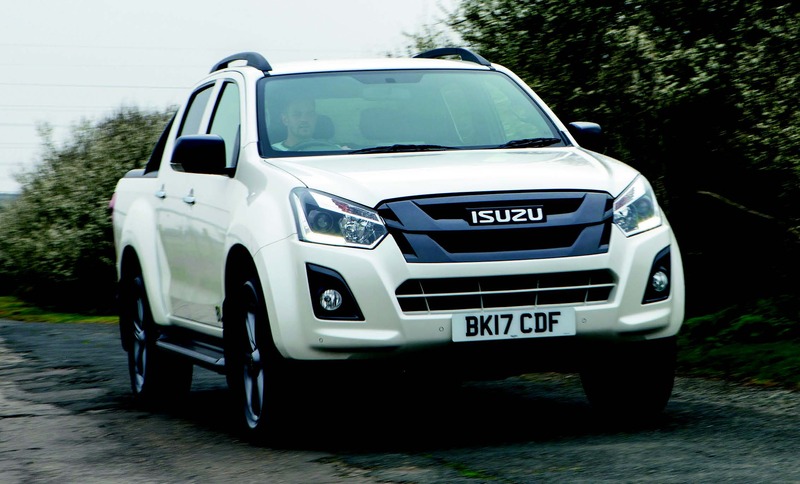 The D-Max tested here is the range-topping Blade double-cab, complete with the optional sixspeed automatic gearbox. This would cost £27,999 plus VAT on the road (that’s £33,599 once the tax man has taken his share). This is a lot less than you’ll pay for some double-cabs. But price apart, does the character of a topspec truck sit comfortably with that of such a small engine? Double-cabs’ interiors can feel a bit utilitarian compared to those of similarly priced SUVs. But between its underlying design and the lavishly dressed-up treatment given to the model on test here, there’s nothing about the D-Max to make you feel like a second-class citizen. In particular, this is a truck which highlights the fact that hard plastics don’t need to feel cheap. All too often, where they occur in everyday vehicles it’s because they’re being used as a way of saving money, and they’re scratchy and brittle as a result. Here, though, while the dash surface has no give, the plastics in which it’s trimmed feel dense, stout and there for a reason. It’s a strong truck and they belong in it. The infotainment module, on the other hand, doesn’t feel as if it belongs. That’s not to say it’s bad, but its 9” screen sits proud of the facia in a frame so large as to totally dominate the rest of the dash. It even sticks up far enough to obscure access to the lidded tray behind it on the dash top, and beneath it is a bank of buttons that’s the opposite of intuitive – and, you’d think, of the purpose of having touch-screen controls in the first place. With sat-nav and phone pairing functions, the unit does have plenty of power, and you’ll learn its controls quickly enough. Aside from its awkward appearance, our main concern would be that the display is hard to read in direct sunlight. Another feature of the Blaze model is its quilted leather seats, which look fantastic and are in the main good and comfortable. We found ourselves getting achey on long journeys, however, and they could do with a little more lateral support. The driving position is good, though, and there’s plenty of adjustment in all directions. You’re not so well provisioned for stowage, with a large cubby box doing most of the work here. And we’d have expected such upmarket seats to have come with adjustable lumbar support. A welcome surprise, however, is that even with the front seats fully back, the rear bench can still take a couple of six-footers. The seat-backs are well sculpted to accommodate your knees; the thick cords on the map pockets do dig in somewhat, and headroom is adequate rather than generous, but there’s a good view out the side and you don’t feel at all cramped. When you’re carrying cargo or equipment that’s too delicate or valuable to be chucked in the load bed, the rear seat-back folds down to create a totally flat platform. That’s a nifty little practicality bonus; the generally usable nature of a onetonner needs no introduction, but as far as this goes the Blade model comes with a damped, wide-opening tailgate and a choice of loadspace cover options. With 164bhp and 265lbf.ft, the new engine is a touch higher on power than the old 2.5-litre unit – but down significantly on torque. This has no apparent bearing on its ability to shift the vehicle, but you do hear it revving considerably more in the process. The auto box obviously has some bearing on this, requiring what sounds like a good bit of effort to keep it wound up. In particular when the engine is cold, the result is an amount of revs which can verge on the alarming; it does settle down as it begins to warm up, but even then it’s quite vocal. There’s no shortage of pull, however, at any position in the rev range. Top torque comes in at 2000rpm and you can hold it on the brakes for a moment as you keep the engine warm in anticipation of fi ring it into a gap in the traffic – which it does with all the briskness you’d hope for. Even just stamping lazily on the loud pedal gets a result, actually, though between the relatively high engine speed for max torque and the need to bring the gearbox into life, you need to put in more work than that if you want it to really spring into action. The box does have a manual over-ride option if you want it, and we found that it’s also very good at keeping you from running away on steep hills. 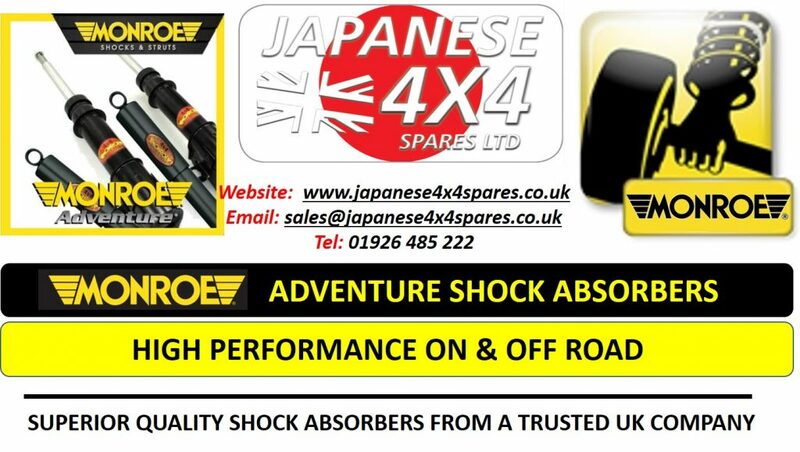 Lift off the throttle and it’ll stay in a low gear to enable compression braking – the result is a gale of noise from under the bonnet until the engine matches its revs to the situation, but for sure it works. Given the constant references we’re making to noise, you could be forgiven for assuming the D-Max didn’t impress us on the motorway. In fact, the opposite is the case – the engine settles down well at speed, with an acceptably low level of droning that can be knocked out by the stereo without having to turn it up stupidly loud. Wind noise is there, as is some thumping from down below, but you could do a lot of miles on this engine without life becoming rude. The D-Max handles tidily for a double-cab, too. Its steering is free of vices and while body roll is there, it’s controlled and predictable. We drove the vehicle with no more than light loads in the back, certainly nothing like enough to influence the springs’ performance significantly, but the wayward bouncing that used to be a pick-up keynote was as good as negligible. 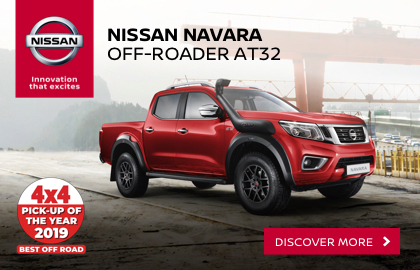 For an entertaining drive in a double-cab, we’d choose a manual every time. However even in this form the D-Max can be hustled through corners with enough zest to put a smile on your face and not enough wallowing to wipe it back off again. Its ride quality is perfectly acceptable, too, with no sign of this model’s 60-profile tyres letting through any more patter or harshness than you’d expect anyway in a one-tonner. We certainly wouldn’t choose a 255/60R18 fitment for off-road work. 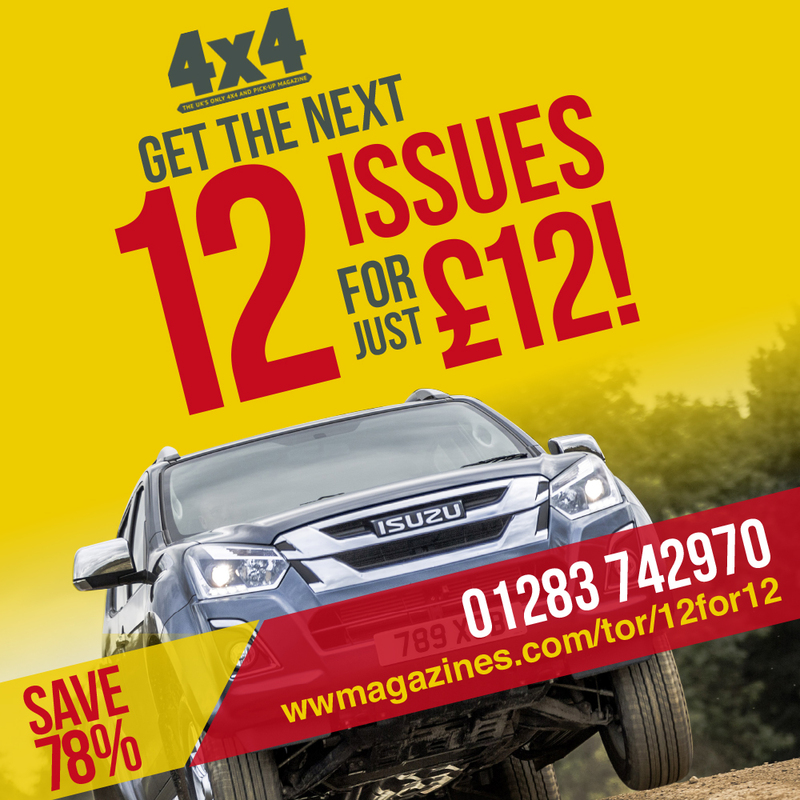 If you’re serious about getting your D-Max the way you want it, however, less elevated models than this run on 245/70R16s – still not what you’d call a common idea of the perfect rubber for all-terrain efforts, but evidence that you can get a 16” rim around Isuzu’s brakes, which of course opens up a world of options in the tread pattern of your choice. Lift it a little, for example, and you could be running a D-Max on 235/85R16s. But before you do that, make sure you know how capable it is in standard form – because unless you really do have tough stuff in mind, as it comes out of the showroom the D-Max is one of the most agile and tractable trucks there is. We’d like to see a locking rear diff at least on the options list, but even without this the vehicle is very sure-footed over uneven terrain and side slopes. With low box engaged, once again the smaller engine makes no apparent difference. Whether the 1.9-litre unit is as effective in the most torque-sapping conditions is something we can’t yet say, but long, steep hills don’t faze it so long as the traction is there. A sound, tax-efficient ownership proposition is at the heart of the pick-up market, and the D-Max has ridden that fact to success. The new engine means lower emissions and fuel costs, so we don’t see that changing – even if it’s not quite as refined as before, even in this topspec Blade form. What you get here is a handsome truck with plenty of kit, real built-in ability and a price which, at £27,999 plus the VAT, undercuts many of its similarly equipped rivals. You also get a hefty looking warranty covering you for five years or 125,000 miles, and if your annual mileage is 6000 or less you’ll only need to take it in for a service every couple of years. With Isuzu’s traditionally solid build quality behind it, all this points to a truck which, even if it’s not the most just-so you can buy, ought to last and last. Our one concern would be if the engine’s working as hard as it sounds at times, as it’s the unknown quantity in the equation – but if that warranty isn’t an example of a car manufacturer putting its money where its mouth is, we don’t know what is. Smaller engine adds economy without taking away too much refinement The D-Max was already an excellent vehicle, and it still is – even if the move from 2.5 to 1.9 litres means it’s now less refined than before. The extra toys help make up for this, though we wouldn’t spend an extra £1000 on the auto box if we could avoid it. Still, it’s a lot of truck for your money – and decreased whole-life costs mean it’s a better value ownership proposition than ever.